ENDWELL Enterprise Co., Ltd. was established in 1976. President Mr. Lee Tong-Cheng. Dedicate in presion progressive die development and making, we successfully built more than 3,000 sets of stamping dies for domestic and internaional customers. In 1995, we set up a joint venture in China with corporation. 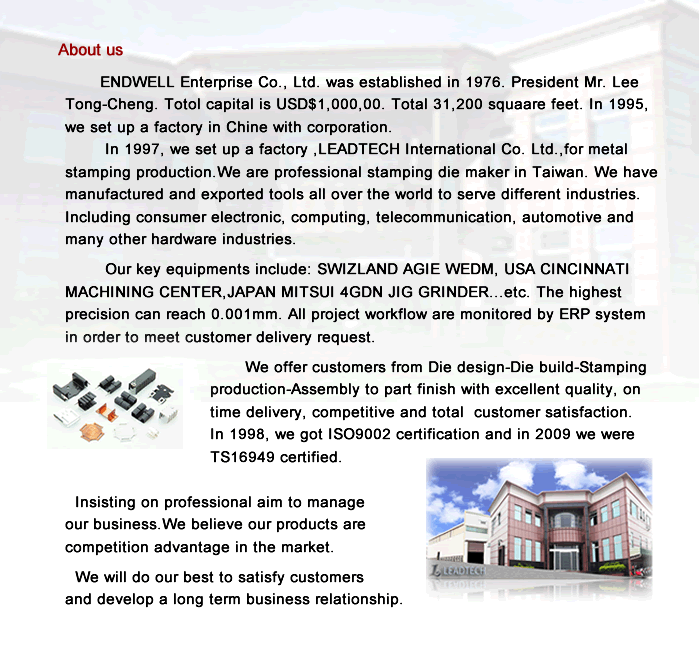 In 1997, we set up a factory ,LEADTECH International Co. Ltd.,for metal stamping production. Totol capital is USD$1,000,00. Total 31,200 square feet. We are professional stamping die maker in Taiwan. Industries served are consumer electronic, computer, telecommunication, automotive, bicycle ,hardware and many other hardware industries. Our key equipments include: SWISS AGIE WEDM,USA CINCINNATI MACHINING CENTER,JAPAN MITSUI SEIKI JIG GRINDER...etc. The highest precision can reach 0.002mm. All manufacturing process are monitored by ERP system in order to meet customer delivery request. We offer customers from Die design - Die build - Stamping production-Assembly to part finish with excellent quality, on time delivery, competitive and total customer satisfaction. In 1998, we were certified ISO9002 certification and in 2009 we were TS16949 certified. Insisting on professional aim to manage our business. We believe our products are competition advantage in the market. We will do our best to satisfy customers and develop a long term business relationship.